In the past, I've blogged about how the deer keep eating the bright and beautifully bold tulips I planted for my hellstrip garden. I've pretty much given up on trying to grow those red and yellow tulips in such an inhospitable environment, despite how beautiful they were. ...and into the middle of my neighbor's lawn. Smart little plant. All of the tulips on my side were eaten. Again. This brought a smile of recognition. It's funny how spring bulbs seem to replant themselves in the strangest places. I would love to know the story of how it got over there! Too funny (the post, not the part about having all your tulips eaten. That is criminal). I'm surprised that the deer didn't get this one too (or is there a fence in your neighbor's yard?). Nope, no fence. I'm impressed it is still there with all the deer, bunnies, and groundhog that are running around this spring. Maybe it's just like Greta Garbo and wanted to be alone! My neighbors have been away traveling, so no one has mowed yet (and it is only now just getting to mowing season here.) I do wonder what they will think if they see it! Ha! That's so familiar. I don't plant tulips anymore unless I get them as gifts or for a giveaway. In my case, it's the rabbits that gobble them up. But occasionally a few find spots among prickly plants or out of the way of the rabbits. So funny that yours showed up in the middle of the neighbor's lawn! So sad to give up tulips since I love them, but I just have too much wildlife around! I've been seeing more and more bunnies around here, too. Your lucky neighbour! That's the kind of garden escapee we could all do with. I know, that would be so much fun to find a flower like that in the lawn! Smart little tulip:) It's funny how they sometimes pop up in places where I know I didn't plant them. So funny. 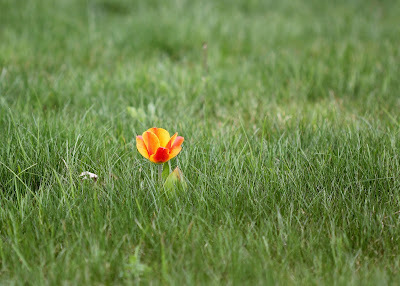 The tulip looked so nice surrounded by lush grass, too. I suspect a squirrel may be the culprit. Maybe you should send your neighbor an invoice. Imagine a tulip packing it's bags and gettin' outta Dodge before the eatin' starts! Epic. Thanks! That looks like a great list! I suppose the tulip bulb carried the field mice. This was the case this year in my garden. That lonely orange tulip looks lovely in the green grass. So clever to hide over there. Maybe you can give some tulips to your neighbours for them to plant. Then maybe some will pop over to your garden. I love garden surprises and that is certainly one. Must have been a seed.